Logic and his estranged wife Jessica Andrea confirmed their pending divorce with a joint statement on Tuesday (March 20). Now, sources say the Maryland rapper initiated the split. Insiders reveal that Logic became distant from Andrea, a social media personality-singer, after the success of last year’s anti-suicide anthem, “1-800-273-8255,” reports TMZ. Following the Grammys, Bobby Tarantino told his wife of two years that he “just wanted to be single,” according to sources. Logic and Andrea reportedly have a prenuptial agreement. It entitles her to an undisclosed payout, but not the house or car. The separation has already begun. Andrea moved out of their home, which they’re selling. She is now staying with a relative. Fans saw this coming. 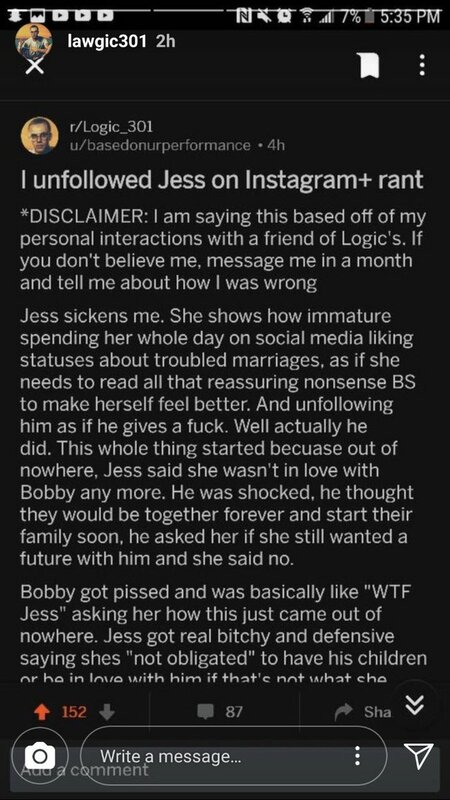 Andrea unfollowed Logic on Instagram, prompting breakup talks last week. Fans later believed Andrea broke up with Logic, due in part to online rumors.